Newspaper Rock: Was Jamestown massacre justified? I wrote about killing during wartime in Diplomacy Works, Violence Doesn't, Anonymous. My position is that violence is justified only as a last recourse, when all other options have failed. Which is rarely if ever the case. To give three examples: Americans didn't try every other option before nuking Japan. Or before invading Afghanistan and Iraq. Similarly, Osama bin Laden didn't try every other option before attacking the World Trade Center. As far as I'm concerned, they're all guilty of unjustified acts of murder. Now let's look at the Jamestown massacre of 1622. Did the Indians try every diplomatic and military option short of a massacre? 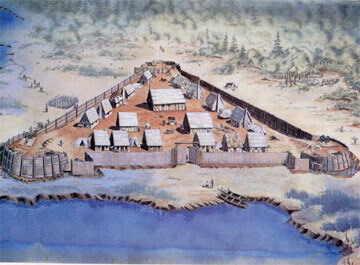 Did they try surrounding Jamestown and starving it into submission? Did they try holding some Englishmen hostage until the others agreed to submit? I believe they tried things of this nature. I don't know if they gave them enough of a chance to work. Do you? But wait...there are more points to consider. The Indians knew the Englishmen's goal was to colonize and "settle" their land. They may have guessed the Englishmen were carriers of mysterious diseases--i.e., walking germ-warfare weapons. In their negotiations, they may have sensed what was undoubtedly true: that the Englishmen would never give up their plans to take America. Given these factors, I could see cases where no other options existed but all-out war. I suspect the Indians believed this was such a case even if that wasn't literally true. When they thought the choices came down to "kill or be killed," they chose to kill. In that sense, I claim their actions were morally defensible. If someone invades your house and threatens to kill you...sure, it would be nice if you could subdue him nonviolently. But that means taking a risk and giving him a chance. If there's a clear and present danger--an American legal standard--you're justified in killing him in self-defense. Needless to say, the Indians were dealing with armed invaders in their home(land)s. Once it was clear that the Euro-American colonizers weren't going to leave, the Indians were justified in using any measure to get rid of them. That includes killing them as a last resort. "My position is that violence is justified only as a last recourse, when all other options have failed." Only combat against a legit target is justified; what was stopping the Powhatan from only attacking English soldiers? "I believe they tried things of this nature. I don't know if they gave them enough of a chance to work. Do you?" I could be wrong but I don't think they did; language and cultural barriers tend to make diplomacy hard. Even if they did do it it DOES NOT justify an inhuman atrocity. "But wait...there are more points to consider. The Indians knew the Englishmen's goal was to colonize and "settle" their land. They may have guessed the Englishmen were carriers of mysterious diseases--i.e., walking germ-warfare weapons. In their negotiations, they may have sensed what was undoubtedly true: that the Englishmen would never give up their plans to take America." 'Grats on making excuses for mass murderers, note the double standard folks; when Natives committ a mass murder it's self defense, when eviiiiil white men commit an atrocity it's evil. Welcome to failsville Rob, population you. "Given these factors, I could see cases where no other options existed but all-out war. I suspect the Indians believed this was such a case even if that wasn't literally true. When they thought the choices came down to "kill or be killed," they chose to kill." Except the goal of Jamestown was not to start a war, the Powhatan believed this would 'put them in their place' and that the surviving English would recognize the Powhatan as the authority. "In that sense, I claim their actions were morally defensible. If someone invades your house and threatens to kill you...sure, it would be nice if you could subdue him nonviolently. But that means taking a risk and giving him a chance. If there's a clear and present danger--an American legal standard--you're justified in killing him in self-defense." Butchering an unarmed child is self defense? Slaughtering an unarmed woman is self defense? You sir are either a piece of work or in dire need of a dictionary. "These cases occasionally come up in the news--usually in Texas. I say that if you come across someone trespassing in your house and he's clearly unarmed, you're absolutely not justified in killing him. But if he is armed, you absolutely are justified in killing him. (The Texas courts may say you're justified in both cases, but I'm more moral than they are.)" You're comparing apples to oranges, sure you have the right to kill an intruder, but you do not have the right to kill that intruder's infant child and wife. "Needless to say, the Indians were dealing with armed invaders in their home(land)s. Once it was clear that the Euro-American colonizers weren't going to leave, the Indians were justified in using any measure to get rid of them. That includes killing them as a last resort." In other words you're saying they had the right to commit genocide; lovely. *Sniff, sniff. * Nothing like the smell of hypocrisy in the morning. Also what exactly was achieved by this horrible massacre? Sweet f*ck all it only made things worse, 'grats on defending the indefensible Rob. For my response, see Rob Hypocritical About Genocide?